In the South Male Atoll, approximately 25 minutes by speedboat from Male. Facilities include an Infinity pool a spa and a fitness centre. There is an excellent watersports centre and snorkelling can be done from the beach. Vela, the main restaurant, is the perfect place to enjoy dishes from the interactive buffet and live cooking stations. But it’s definitely worth trying the à la carte offerings which include the popular Teppanyaki with its idyllic spot over the lagoon and serving Japanese cuisine with a creative twist, and Sand, where you can enjoy dishes inspired by the Indian Ocean on candlelit tables dotted along the beach. There are also two fabulous bars. Fen Bar is cool and minimalistic with mood lighting and chilled music, and the place to relax with a cocktail and shisha. For drinks in a gorgeous setting, head to Chill Bar at the water’s edge and grab yourself one of the chic daybeds overlooking the ocean. There are upgraded meal plans available including All Inclusive. 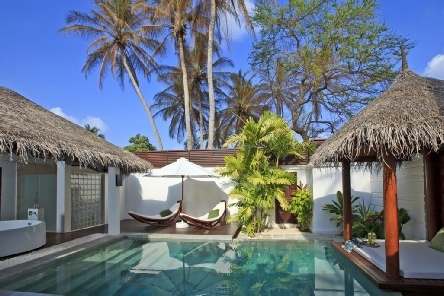 Stunning Velassaru has stylish facilities, fantastic fine dining and exceptional service. The glistening beach and bright turquoise lagoon create a serious ‘wow’ factor on arrival. The resort has a slightly younger vibe and is ideal for honeymooners and couples. 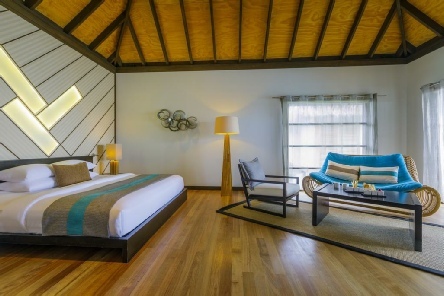 2019 package holidays to the Velassaru Maldives Prices are per person based on two sharing.